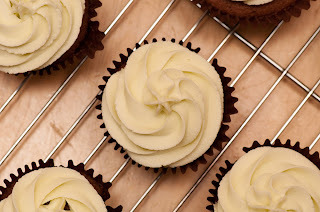 In the interests of time and sanity I'm going to bung together a few sets of cupcakes into one post! It was Mike's birthday in June and his birthday cake is one of the most important events in my cake calender! I was a little disappointed with myself about his cake from last year, having messed up one of the layers, so I wanted to make sure I had something decent this year. 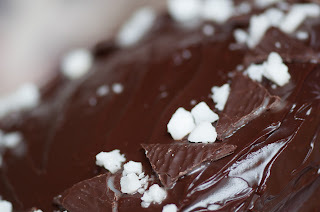 This Grasshopper Cake from The Pink Whisk had been firmly ensconsed in my bookmarks since March - as soon as I saw it I knew it was The One, since Mike is a big After Eights fiend. I knew it would be a labour of love, with a couple of different steps for the decorating (not my strong suit). The crumb coating of buttercream was a particular worry, with me not having much* patience I wasn't sure how that would go - especially as I couldn't really ask Mike to take over on this one (normally he steps in when I get to the 'I'm going to stab myself in the eye with the pallette knife' stage).